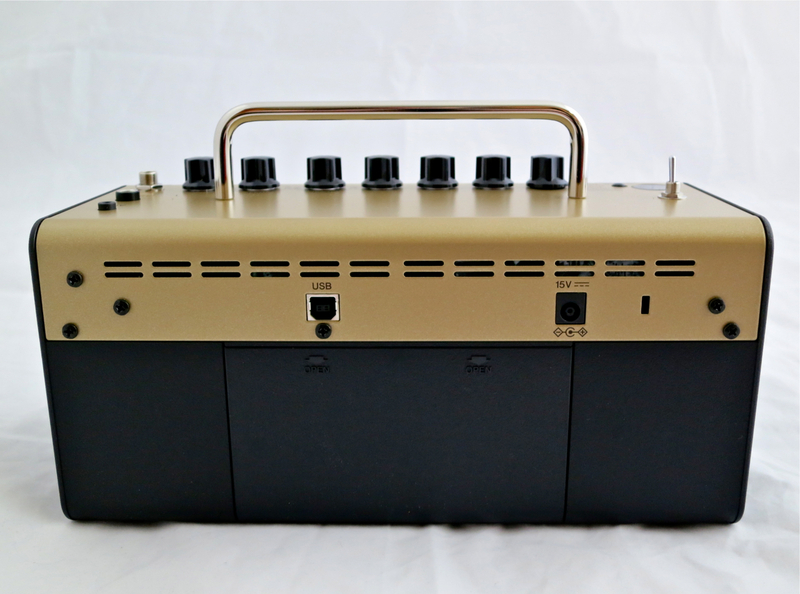 The brass-metallic coloured THR5A is a 5 Watts combo aimed specifically at electroacoustic guitars, and features digital microphone modelling, amongst other things. 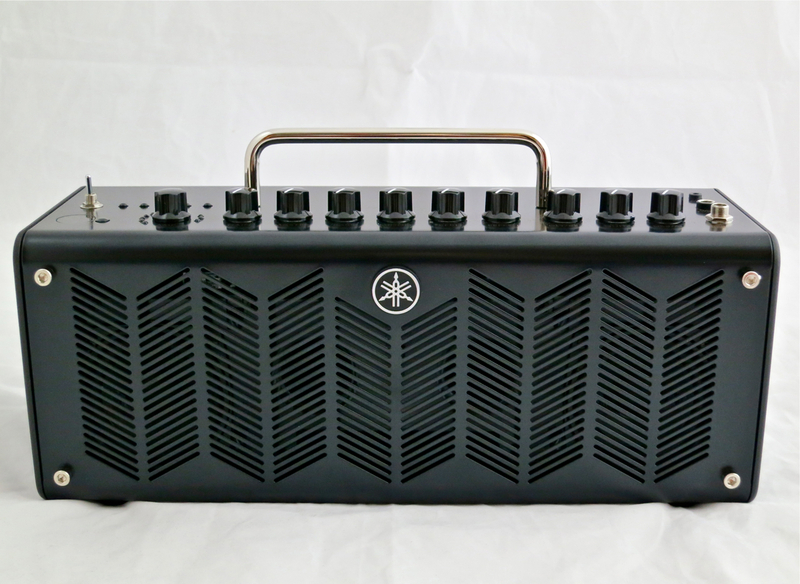 The regular Yamaha THR10 has now gotten two sister models. The black THR10C concentrates on ”classic” and ”boutique” tones to satisfy the friends of classic Sixties and Seventies Rock and Blues. 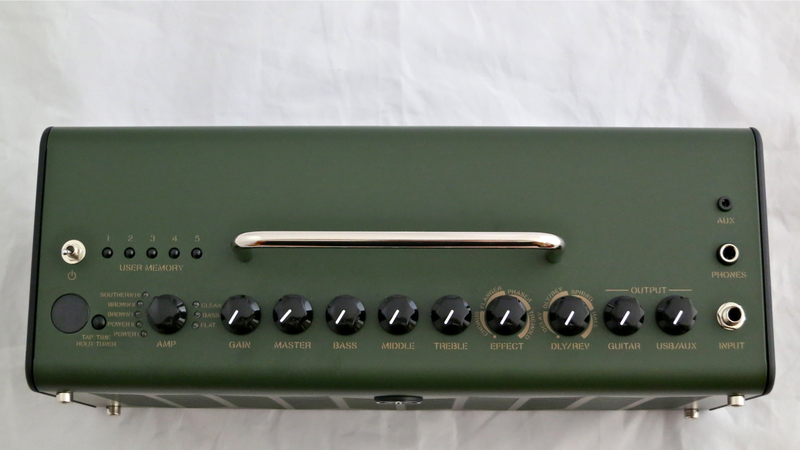 The army-green THR10X is aimed squarely at the connoisseurs of all things hard and heavy, concentrating on Hard Rock-, Metal- and Thrash-tones. All combos have a sturdy metal chassis with plastic sides. The overall design clearly takes a lot of cues from today’s high-end tube Hi-Fi gear. All THRs come equipped with a digital tuner. All of the small amps feature a built-in USB-soundcard, which can be utilised for recording purposes (Steinberg’s Cubase AI comes with each amp), as well as for using the amp as your personal stereo system. With the help of Yamaha’s THR Editor software you can also programme your own amp settings via the USB-port. As an added bonus, the THR Editor gives you access to some hidden functions (like the noise gate, or in the THR5A’s case also additional effects) that cannot be accessed from the front panel. 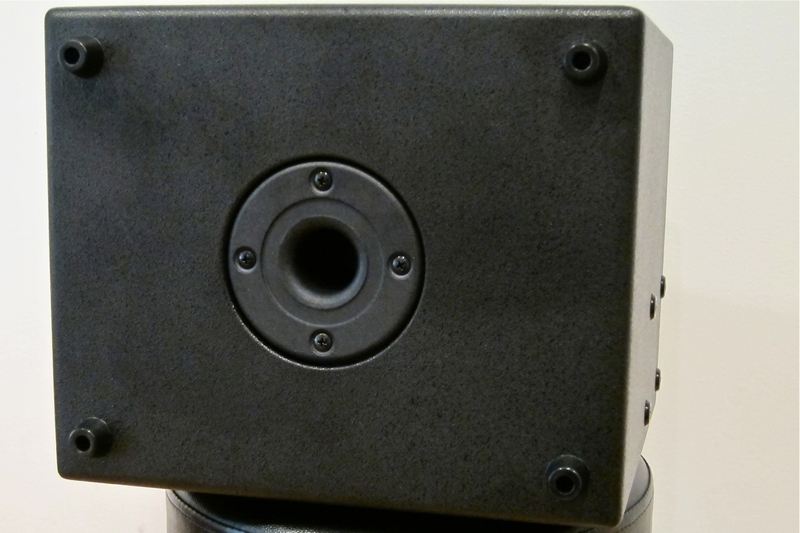 …while on all THR10-models it has been sunk into the amp’s base plate. Naturally, a quality, laptop-type PSU is supplied with all models. Regardless of the fact that the Yamaha THR5A (current price in Finland: 199,99 €) is one of the world’s smallest acoustic amps, it is still packed chock-full with tasty features. The THR5A offers you four different virtual microphones to turn your piezo’s tone into the sound of a mic’ed up acoustic. Three settings are meant for steel-string acoustics, with the fourth being reserved for nylon-string electroacoustic guitars. The last Mic Type selection reads ”EG Clean”, being a clean electric guitar amp model for your occasional Jazz Box meanderings. The Blend-control lets you change the balance between the dry piezo signal and the modelled virtual mic. Offering only a single master tone the THR5A’s EQ-section is rather spartan, but the effect section is far better endowed: The Effect knob gives you compression, chorus or a combination of both. Delay/Reverb delivers delay, reverb and a combination effect. You can adjust delay times using the Tap Tempo button on the far left. The vintage-inclined Yamaha THR10C (current price in Finland: 299,99 €) is larger than the THR5A, and it also offers more features. 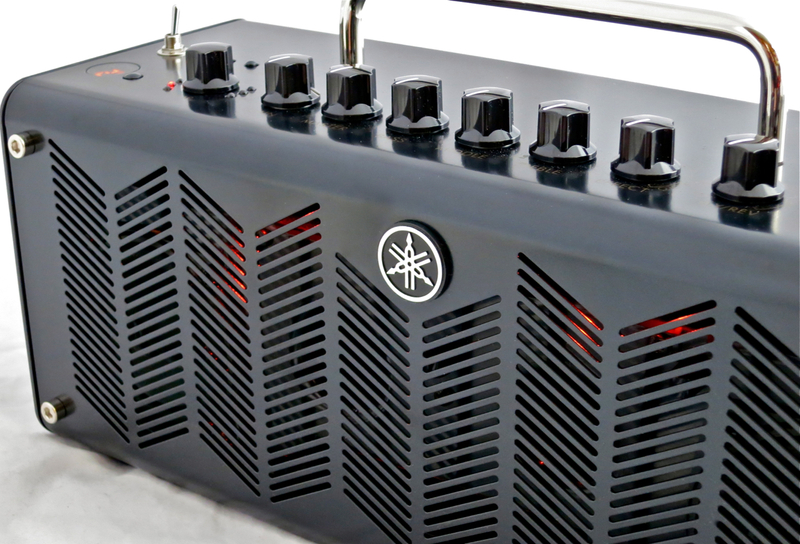 The THR10C comes loaded with five guitar amp models, whose names already give you a very good idea of their soundscape:. In addition, there’s one bass amp model, as well as a setting for acoustic guitar. The neutral sounding Flat-selection is a good choice if you want to amplify a synth or digital piano. 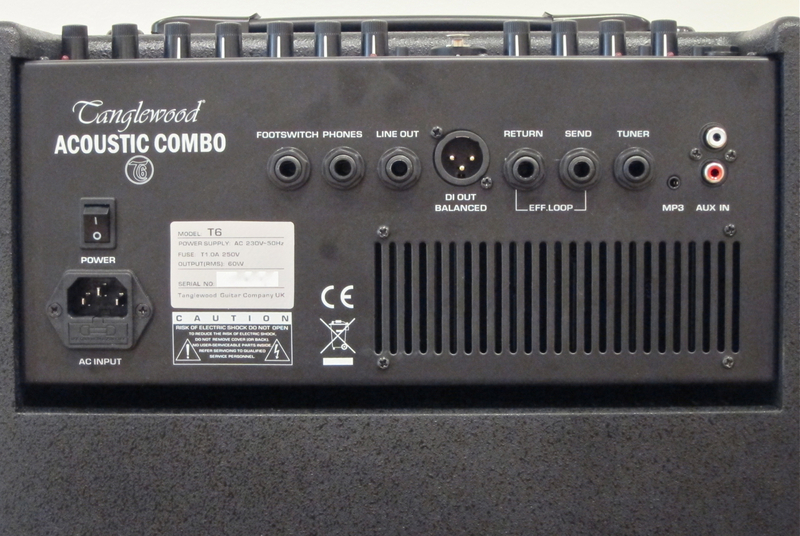 The THR10C’s EQ-section is a three-band affair, while the effect department offers eight different effects. Turning the Effect-knob gives you access to a chorus, a flanger, a phaser and a tremolo effect. Delay/Reverb offers you tape echo, spring reverb, hall reverb, as well as a echo/reverb-combination setting. 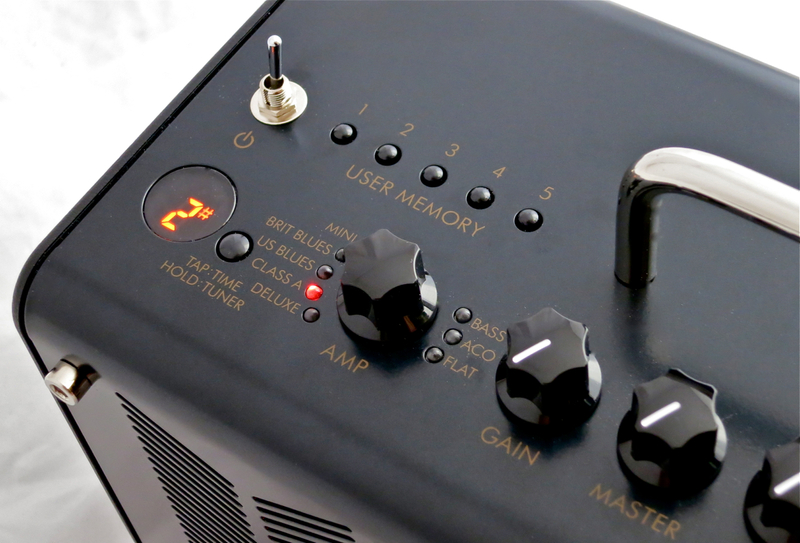 All THR10-models sport five memory slots to store your favourite amp settings. The Output-section offers you two volume controls, with one being the guitar section’s master volume and the other dealing with the signal coming in via USB (or the auxiliary input). 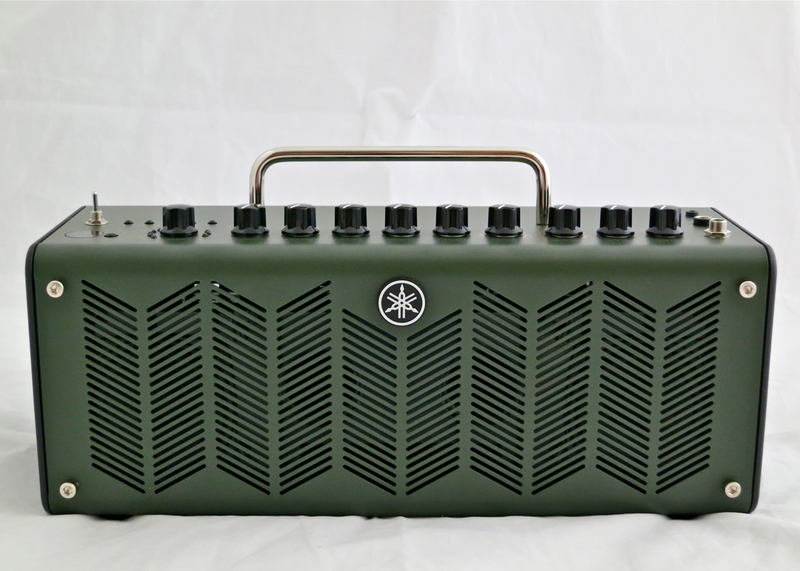 It may be small, but it still is fierce – the Yamaha THR10X (current price in Finland: 299,99 €) is tailoured to all Rock and Metal. 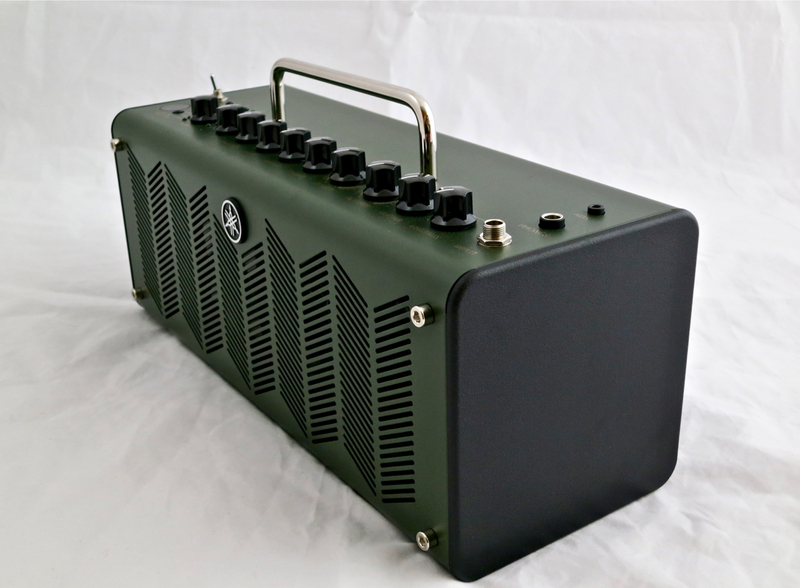 The THR10X’s Amp-department holds in store five high gain amp models, each with its own tonal footprint, with differences in areas such as bass punch and overall compression. A Clean model is also supplied for the occasional ballad or two, along with a Bass amp and the Flat setting. The THR10X features the same type of three-band EQ as it’s sister model. The effect department is also nearly identical, save for the THR10X’s brighter Delay-effect. I think it’s great that Yamaha have designed their entire THR-range as stereophonic combos, because this way the amps also have a clear appeal as ”lifestyle accessories”. As pure guitar amps, stereo brings out the depth in some effects, especially reverbs, but when used as a personal micro-Hi-Fi stereo is the only way to go. Yamaha’s decades-long experience in the Hi-Fi-field really shows in the sound of these small combos. The sound is full, clear, punchy and dynamic. The tiny THR5A already sounds better than most built-in computer sound systems, even if the breadth of the stereo picture isn’t as wide, and the bass response as deep as in the larger combos. The THR10s really hit the sonic jackpot, and will blow many micro-Hi-Fis off the table, hands down. 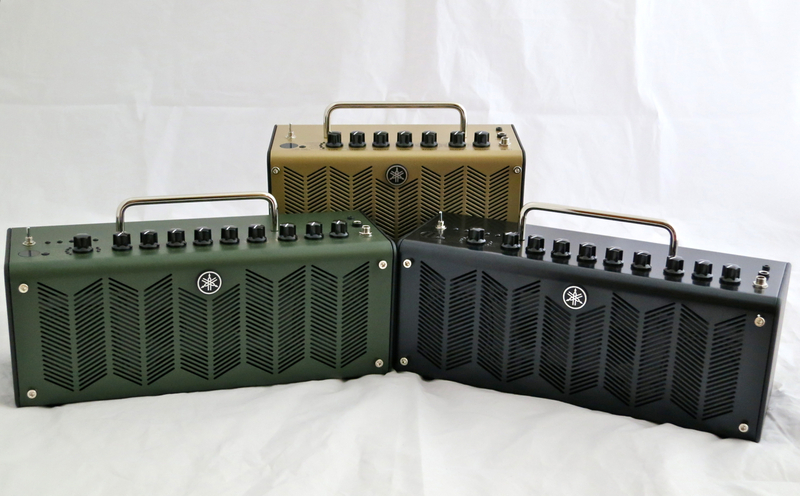 For a guitarist the THR-series is a stylish way to combine an mp3-boombox with a practice amp. I must admit that the THR5A’s raison d’être is not quite clear to me. At home you normally wouldn’t need to use and amp with an acoustic guitar, but on the other hand this tiny combo really doesn’t cut it at, say, a pub gig. Maybe the THR5A is meant mainly for busking. On the other hand I can’t deny that this dwarf’s virtual microphones sound surprisingly realistic, so maybe this combo’s main function is to serve as a specialised soundcard in your home or project studio. The amp’s cool mic modelling really manages to turn those dry and upfront piezo tones into something organic and beautiful. The effects also sound very good. Ooh, man, I really dig this combo! 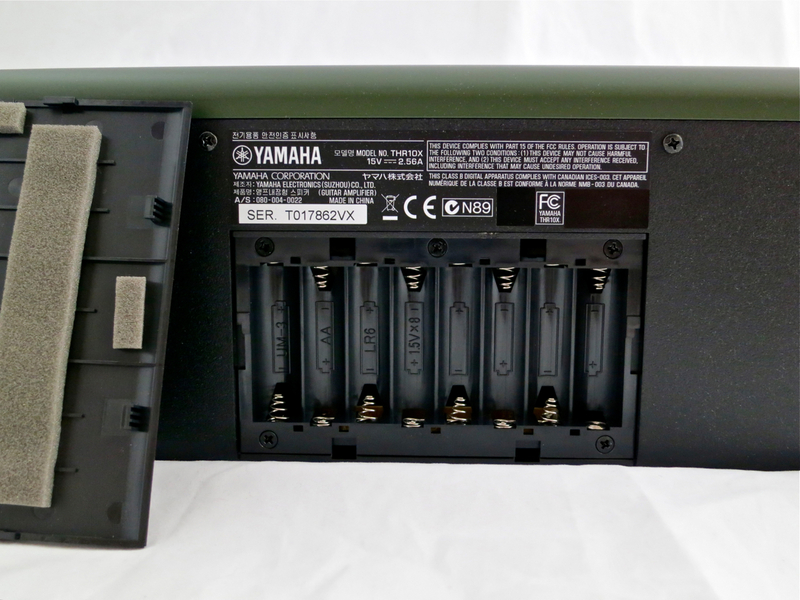 I wouldn’t change a single amp model on the Yamaha THR10C – each sounds great and has plenty of depth and character. The effects also sound great, with the spring reverb coming over especially realistically. Some jokers occasionally quip that all Heavy and Metal guitar tones sound alike. The truth is nevertheless that there are all sorts of different types of overdriven and distorted guitar tones to be found in Hard Rock, Metal and Thrash. The most distinct differences are usually found in the mid-range character and the bass response of saturated distortion tones. To my knowledge, Yamaha’s THR10X is the world’s first and only practice amp devoted specifically to full-on Hard Rock and Metal. And what a great job it does! In my opinion these new THR-models are a great move by Yamaha. These specialised combos will satisfy those guitarists who have wished for more of their own genre in the same combo, while leaving the successful basic models – the THR5 and THR10 – untouched, and the overall concept of the THR-series intact. Messinginhohtoinen THR5A on viisiwattinen pikkukombo akustiselle kitaralle, joka on varustettu mm. mikrofonimallinnuksilla. Yamaha THR10 on saanut kaksi rinnakaismallia, joista musta THR10C on tarkoitettu 1960- ja 70-luvun Rock- ja Blues-klasikkosoundien ystäville, kun taas armeijanvihreän THR10X:n erikoisalaa ovat Hard Rock-, Metal- ja Thrash-genrejä. Komboilla on kestävä kotelo taitetusta metallista, sekä muovista. Vahvarien tyylitelty ulkonäkö on saanut selviä vaikutteita high end -audiolaitteista. Kaikissa THR-komboissa on sisäinen viritysmittari. Kaikissa THR:eissä on sisäänrakennettu usb-äänikortti. Komboja voi käyttää sekä kitararaitojen tietokonepohjaiseen äänittämiseen (Steinberg Cubase AI kuuluu hintaan) että muusiikin kuunteluun. Yamahan THR Editor -softalla pystyy usb:n kautta myös ohjelmoimaan oman THR-kombonsa. Softalla pääsee käsiksi myös muutamaan ”piilotettuun”, sisäiseen parametriin (esimerkiksi kohinaportin asetuksiin), sekä THR5A:n tapauksessa myös lisäefekteihin. …kun taas THR10-malleissa se on upotettu vahvistimen pohjaan. Laadukas virtalähde kuuluu luonnollisesti kaikissa malleissa pakettiin. Vaikka Yamaha THR5A (199,99 €) on yksi maailman pienimmistä vahvistimista akustisille kitaroille, on kärpässarjalaiseen kuitenkin mahdutettu pitkä lista ominaisuuksia. THR5A tarjoaa neljä virtuaalimikrofonia pietsomikrofonilla varustetuille akustisille. Näistä kolme on tarkoitettu käytettäviksi teräskielisten kanssa, ja viimeinen on erikoistunut nailonkielisiin. Mic Type -valitsimen viimeinen pykälä – EG Clean – on puhtaan kitarakombon vahvistinmallinnus, jonka voi valita silloin, kun haluaa soittaa THR5A:n kautta sähkökitaraa. Blend-säätimellä voi asettaa pietsosignaalin ja mikkimallinnuksen keskenäistä suhdetta. Pikku-Yamahan EQ-osasto on yhdellä Tone-säätimellä hyvin pelkistetty, sen sijaan kombo tarjoaa peräti kuutta efektiä. Effect-lohkosta saa joko kompressorin tai choruksen tai sitten yhdistelmän näistä kahdesta. Delay/Reverb-osasto tarjoaa nimensä mukaisesti viivettä, kaikua tai viiveen ja kaiun komboefektiä. Viiveajan voi säätää kätevästi Tap Tempo -napilla. 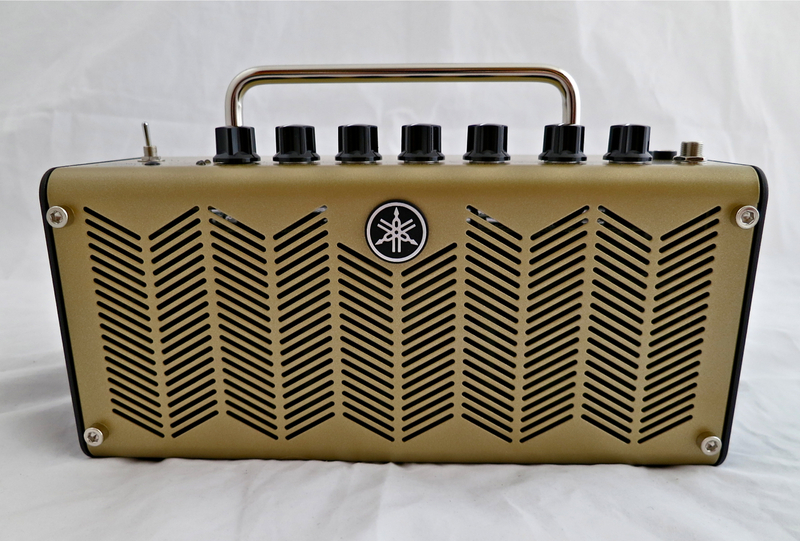 Vintage-puoleen kallistuva Yamaha THR10C (299,99 €) on hieman THR5A:ta isompi värkki, ja isoveljellä on myös enemmän ominaisuuksia tarjottavana. THR10C:ssä on viisi vahvistinmallinnusta, joiden nimistä saa jo hyvän vihjeen, millaisia soundeja on odotettavissa. Niiden lisäksi löytyy basistille myös kelpo bassovahvistinmalli, sekä yksi akustiselle kitaralle tarkoitettu asetus. Neutraali Flat-pykälä taas sopii hyvin esimerkiksi synan vahvistamiseen. THR10C:n EQ-osasto on kolmialueinen, kun taas efektejä on tarjolla kahdeksan kappaletta. Effect-puolelta löytyy chorus, flanger, phaser ja tremolo, kun taas Delay/Reverb-lohkosta irtoavat nauhakaiun, jousikaiun ja hallikaiun vaihtoehtoja, kuten myös yksi viiveen ja kaiun yhdistelmä. Kaikissa THR10-malleissa on viisi muistipaikkaa soittajan omia luomuksia varten. Output-osasto tarjoaa peräti kaksi volume-säädintä – yksi kitarapuolelle ja toinen usb-väylältä (tai Aux-tulolta) tulevalle ulkoiselle signaalille. Pieni, mutta pippurinen Yamaha THR10X (299,99 €) on optimoitu metallimiehille (ja tietysti -naisillekin) sopivaksi. THR10X:n Amp-lohkosta löytyy peräti viisi erilaista high gain -särökanavaa, joista jokaisella on oma soundinsa, sekä erilaisia luonteita esimerkiksi basson tiukkuudessa tai kompressoinnissa. Satunnaista heavy-balladihetkiä varten mukaan on mahdutettu myös yksi puhdas virtuaalivahvistin, sekä Bass- ja Flat-asetukset. Myös THR10X:ssä on kolmialueinen taajuskorjain. Efektiosastot ovat lähes samat kuin THR10C-kombossa, THR10X:n kirkkaampaa Delay-efektiä lukuunotamatta. Mielestäni on erittäin hienoa, että Yamaha on suunnittellut koko THR-mallistonsa stereofoniseksi, koska nämä kombot toimivat tällä tavoin loistavasti myös lifestyle-lisälaitteina. Stereofonia tarjoaa kitarakäytössä etenkin laajempia kaikuja, mutta erittäin tärkeää se onkin musiikin toistossa. Yamaha-konsernin pitkä kokemus laadukkaiden hifi-laitteiden valmistajana kuuluu selvästi. Soundi on mehevä, puhdas ja dynaaminen. Pieneltä THR5A-kombolta saa jo huomattavasti paremman musiikkinautinnon kuin tavallisista tietokonekaiuttimista, vaikka stereokuva ei ole niin leveä, eikä bassotoisto niin muhkea kuin THR10-sarjalaisilla. Isojen kombojen soundi taas on todella ällystättävä ja pyyhkii monet pikkustereot pöydältä. Kitaristille Yamahan THR-sarjalaiset korvaavat tyylikkästi mp3-soittimen vahvistinjärjestelmää, samalla kun toimivat laadukkaina kotivahvistimina. Pienen, elektroakustiselle tarkoitetun vahvistimen järkevyydestä voi toki olla montaa mieltä, kun kotona soitettaessa vahvistinta yleensä ei tarvita eikä haluta. Keikoissa taas Yamaha THR5A:n kokoinen laite on yleensä tehojensa vuoksi melko alakynnessä. Kombon olemassaolon tarkoitus on kenties katusoitossa. Toisaalta täytyy myöntää, että pikku-Yamahan mikrofonimallinnukset toimivat yllättävän hienosti ja uskottavasti, joten on ehkä luontevinta käyttää THR5A-komboa elektroakustiselle erkoistuneena äänikorttina kotiäänityksissä tai projektistudiossa. Vahvarin mikrofonimallinnukset nimittäin onnistuvat kiitettävästi pietsosysteemin kuivuuden ja suorasukkaisuuden poistamisessa. Myös pikkukombon efektiosasto toimii hyvin, ja tarjoaa akustiselle sopivimmat efektit. Mahtavaa meininkiä! En vaihtaisi Yamaha THR10C:n vahvistinmallinnuksista yhtäkään pois – jokainen vahvistintyyppi kuulostaa hyvältä ja vastaa ainakin omat odotukseni siihen. Myös efektien laatu on hieno sekä modulaatioefektien kannalta että kaikujen ja viiveiden osilta. Jousikaiun mallinnuksessa on onnistettu mielestäni erittäin hyvin. Pintapuoliset kriitikot väittävät, että kaikki Heavy- ja Metal-soundit kuulostavat samalta moottorisahalta. Totuus on kuitenkin, että myös Hard Rockissa, Metal-genressä ja Thrashissa käytetään monia eri särösoundeja ja vivahteita. Etenkin keskialueen soinnissa ja basson tiukkuudessa on olemassa monta eri vaihtoehtoa. Yamahan THR10X on tietääkseni maailman ainoa harjoitusvahvistin, joka on kokonaan omistettu raskaalle musiikille, ja se lunastaa kaikki lupauksensa avokätisesti! Uudet THR-mallit ovat mielestäni todella hyvä veto Yamahalta. Erikoismalleilla tyydytetään sellaisten kitaristien toiveita, jotka toivoivat tietyille genreille enemmän vaihtoehtoisia soundeja, kuin mihin yleishyödylliset perusmallit – THR5 ja THR10 – pystyvät, mutta ilman että THR-sarjan hyvin toimiva yleiskonsepti muuttuu. 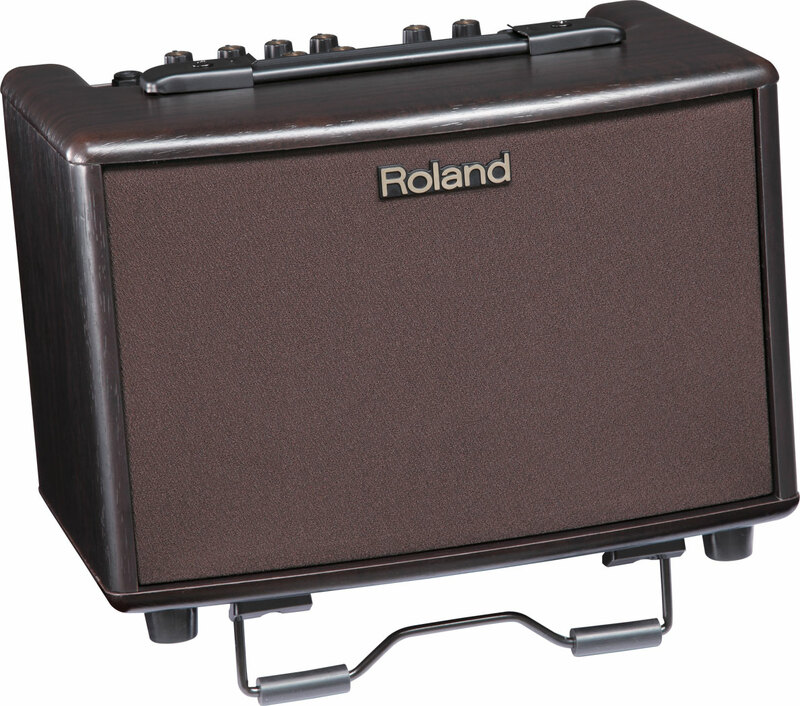 Roland’s AC-33RW (current price in Finland: 467 €) is the new sister model to the all-black AC-33. The acoustic combo is finished in a faux-rosewood finish – the same kind as seen on many pieces of furniture. 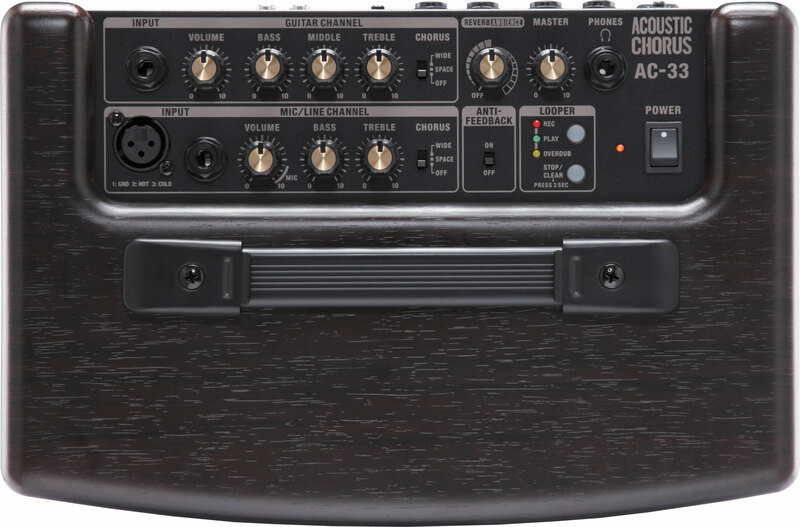 The AC-33RW is the company’s smallest amplifier for acoustic guitar and vocal. It can be plugged into a wall socket, using the power adapter included with the amp. 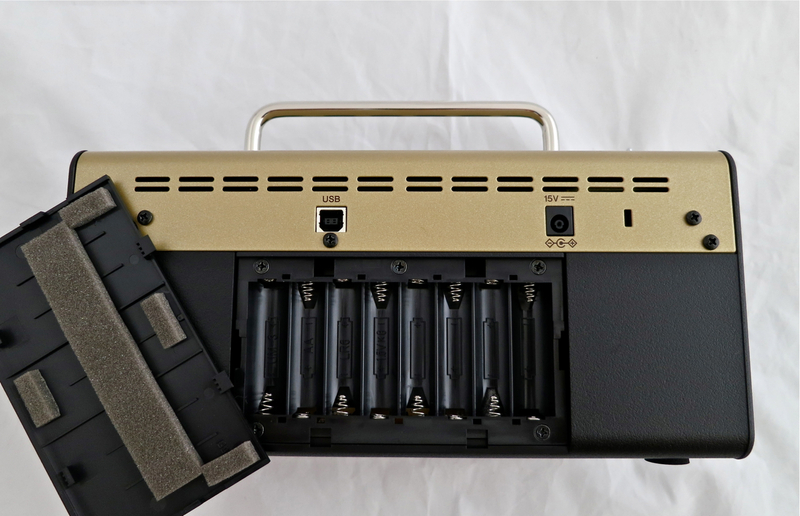 Alternatively, the AC-33 also runs on eight AA-size batteries, giving you somewhere between eight and nine hours of continuous use (depending on the type of battery used). The AC-33RW weighs only a little over four and a half kilos, but is still able to dish out a whopping 30 Watts of power (20 W, if run on batteries)! 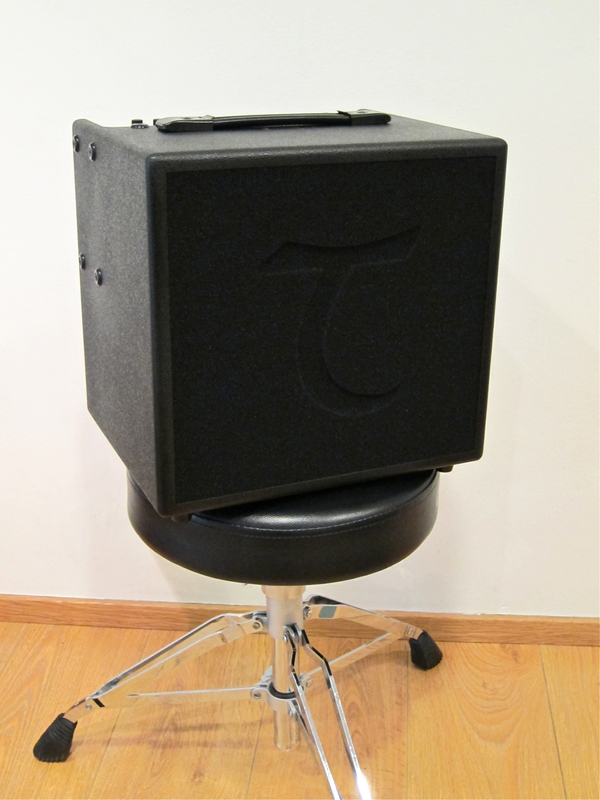 The cabinet comes equipped with a pair of five-inch speakers, with a bass reflex port placed between them. The Guitar-channel, which is meant for use with an electro-acoustic guitar, comprises a volume knob, as well as three-band EQ. The second channel is called Mic/Line, and it is best used for the amplification of a dynamic microphone or a line level sound source (which could also be a second acoustic guitar). Mic/Line only offers you two-band equalisation in addition to its volume control. By the way, you cannot use both of the Mic/Line-channel’s inputs simultaneously! Plugging into the phone jack mutes the XLR-input. Both channels feature a nice, switchable chorus-effect in two different permutations – Space is a light chorus setting, while Wide will give you quite a fat chorus sound. The AC-33RW’s master section offers you an automatic anti-feedback circuit, a looper with 40 seconds of recording time, a headphones output for quiet practising, the Reverb/Ambience-control, as well as the master volume. Next to the power supply input you will find two foot switch connectors. With two (optional) twin foot-switches you can control all looper functions, as well as turn on/off the chorus and/or reverb effects on the fly. The amp’s output can be sent to a mixing console or a sound-card via the stereophonic line output. 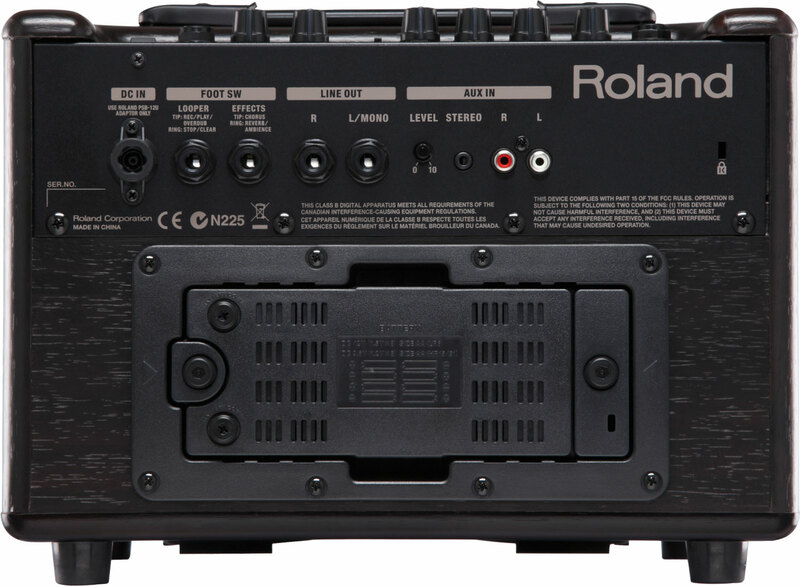 The Line Out signal is routed pre-master, meaning you can use the Roland freely as your stage monitor, without inadvertently changing the signal level going to the front-of-house mixer. The Aux In offers you a choice of two different connectors (RCA and mini-jack), and even has its own level control. The incoming signal is also send through the looper, meaning you can even use your mp3-player to provide the raw material for your live loops. The additional fold-out stand angles the combo for a better listening position, whenever the Roland is placed on the floor. 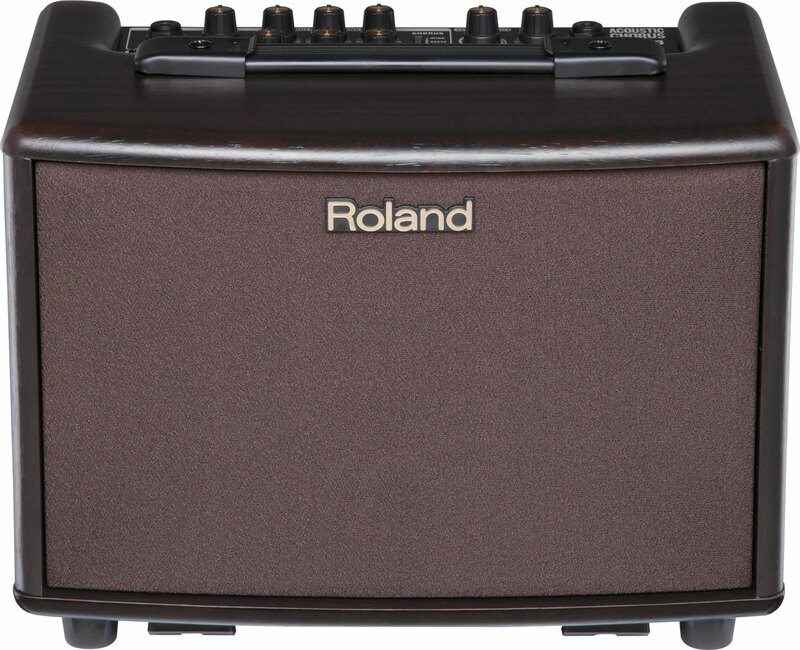 The Roland AC-33RW is a very nifty little combo for acoustic guitarists and solo performers. 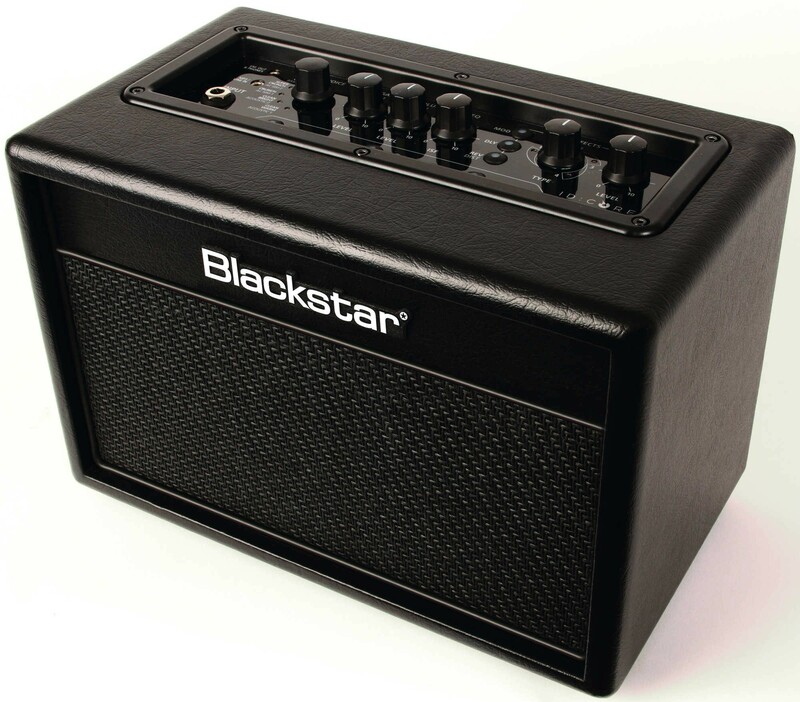 The amp sounds clean and clear, and dishes out a surprising amount of wallop for its compact size. There’s enough power on tap for busking and small-scale, bistro-type gigs. For larger venues I’d suggest turning to one of Roland’s larger models – like the Roland AC-60 – because otherwise the usual din in a pub will most likely drown out your playing. I tried both channels using the same guitar (a Tanglewood TW1000HSRE), and found out that they’re voiced slightly differently. The Guitar-channel has a perceivable presence lift, while Mic/Line sounds more neutral (with both channel-EQs set to neutral). Even if the life of an acoustic performer most probably isn’t as rough as a Rock gig, I would have liked to have seen corner protectors on the AC-33RW. As it stands, you will have to be rather careful not to bump into things with the combo during set-up and teardown, if you want to preserve the Roland’s pristine looks. My second point of criticism concerns the global Reverb/Ambience-control. It would be nice to be able to set different amounts of reverb for each channel – either via separate channel sends or a reverb balance knob. The compromise on offer now is workable, but having different reverb-levels for guitar and vocals would be just that bit more convenient. 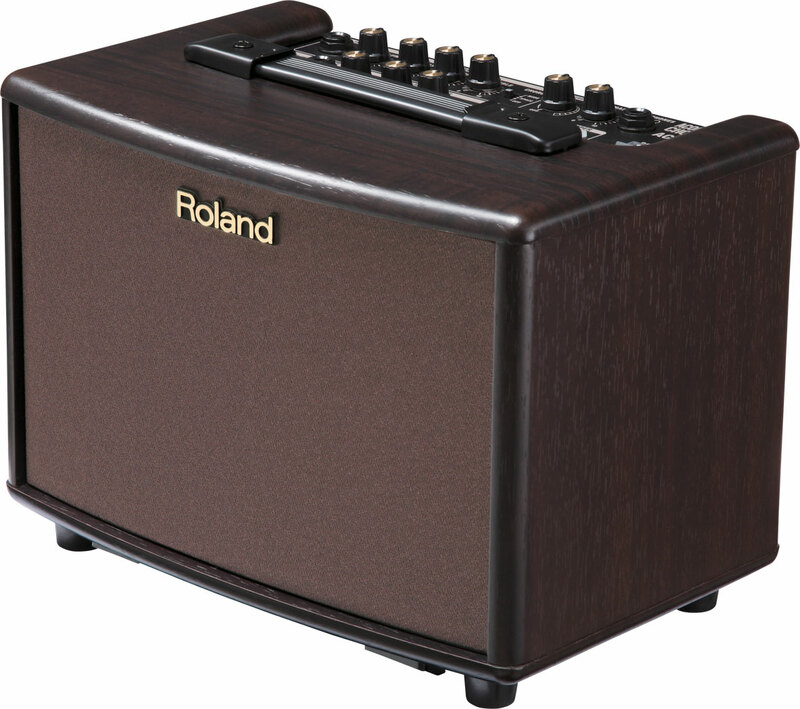 The Roland offers a great basic sound, nice effects, and all the most important features. The combo works really well. I’d warmly suggest buying a set of foot-switches to make the most of the AC-33’s cool looper. 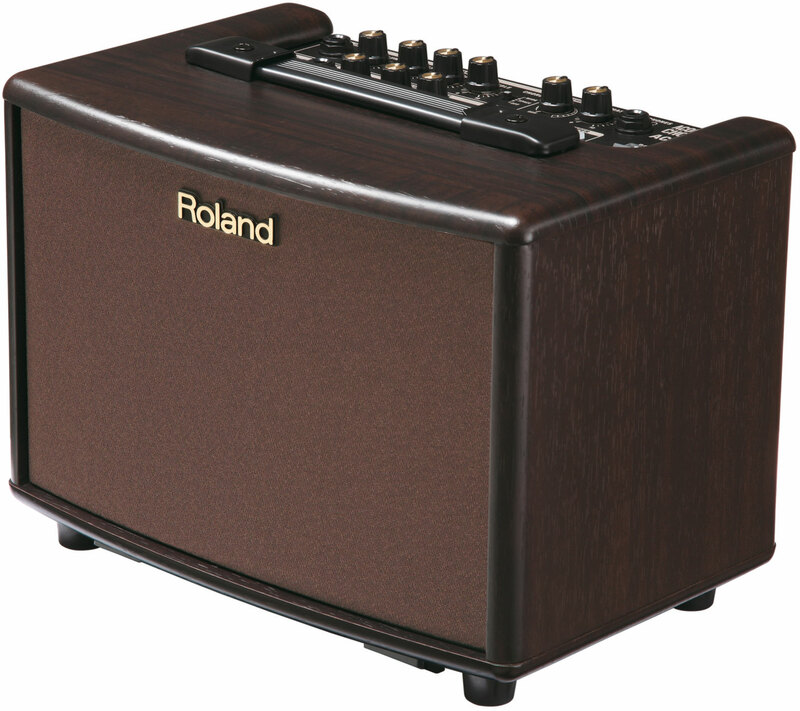 Regardless of its small size, the Roland AC-33RW really is a fine little amp for acoustic performers in small settings. Roland AC-33RW (467 €) on mustan AC-33:n uusi sisarmalli ruusupuu-tyylisellä viimeistelyllä. Pikkukombo ei ole päällystetty oikealla ruusupuulla (tai palisanterilla), vaan tässä käytetään monista huonekaluistakin tuttua keinotekoista materiaalia. Rolandin AC-33RW on firman pienikokoisin kombovahvistin akustiselle kitaralle ja laululle. Se toimii sekä omalla virtalähteellä (kuuluu pakettiin) että kahdeksalla AA-paristolla, jolloin sen käyttöaikaa on – käytetystä paristotyypistä riippuen – jossain kahdeksan ja yhdeksän tunnin välimaastossa. Painoa on AC-33:lla vain hieman yli neljä ja puoli kiloa – oikea kärpässarjalainen siis – mutta tehoa löytyy peräti 30 wattia (20 W paristoilla)! Stereofonisesta kombosta löytyy kaksi viisituumaista kaiutinta, ja kotelossa on bassorefleksiaukko niiden välissä. Guitar-kanava on tarkoitettu elektroakustiselle kitaralle, ja sillä on volume-säätimen lisäksi kolmialueinen EQ-osasto. Toinen kanava on Mic/Line-kanava, johon voi kytkeä laulumikrofonin tai vaikkapa toisen mikillä varustetun kitaran. Mic/Line-kanava tarjoaa vain kaksialueisen EQ:n soundin hienosäätämiseen. Kanavan kaksi tuloa ei voi muuten käyttää samanaikaisesti – kun jakkituloon kytketään jakki, kombo automaattisesti mykistää XLR-tulon signaalia. Molemmissa kanavissa on tarjolla chorus-efekti kahtena eri versiona, joista Space-vaihtoehto on se miedompi ja Wide taas se leveämpi ja täyteläisempi versio. AC-33RW:n master-lohkosta löytyy Rolandin automaattinen Anti-Feedback kierronesto, kätevä 40 sekunnin loopperi, kuulokelähtö, Reverb/Ambience-säädin kaiulle, sekä master volume. Virtalähden tulon vierestä löytyy peräti kaksi jalkakytkimille tarkoitettua tuloa. Kahdella tuplapedaalilla pystyy ohjata kaikkia loopperin toimintoja, sekä kytkeä chorus- ja kaiku-efektejä päälle ja pois lennossa. Stereofonisesta linjalähdöstä voi lähettää AC-33:n signaalin mikserille tai vaikkapa äänikortille. Line Outin signaali haarautuu lähdöille ennen master volumea, minkä ansiosta Rolandia pystyy käyttämään henkilökohtaisena monitorina lavalla, samalla kun ääni menee ison PA:n kautta yleisölle. Aux In -tulo tarjoaa ulkoiselle äänilähteelle kaksi eri liitintyyppiä – RCA ja pikkujakki – sekä oman tasosäätimen. Aux-tulon signaali menee loopperin kautta päätevahvistimeen, joten senkin pystyy looppaamaan. Taitettavalla metallijalalla voi kallistaa kombon viistosti ylöspäin, mikä edesauttaa lattialla seisovan pikkukombon kuulemista. Roland AC-33RW on erittäin näppärä pikkukombo akustiselle kitaristille ja trubaduurille. Kombon ääni on siisti ja raikas, ja yllättävän äänekäs. AC-33:n teholla pystyy vetämään mukavasti katusoittoa ja pieneimuotoisia keikkoja, esimerkiksi sivistyneessä kahvilassa tai pikkubaarissa. ”Oikealle” ravintola- tai baarikeikalle lähtisin trubaduurina kuitenkin mieluummin pikkukombon isoveljen (esimerkiksi Roland AC-60:n) kanssa, muuten ääni ja kitara jäävät helposti volyymiltään tavallisen hauskanpidon aiheuttaman metelin alakynteen. Kokeilin samalla kitaralla (Tanglewood TW1000HSR E – testi tulossa) molemmat kanavat ja huomasin, että kanavilla on hieman erilainen perusluonne. Guitar-kanava kuulostaa neutraaliasennossa selvästi raikkaammalta kuin neutraalimpi Mic/Line-kanava. Vaikka meiniki akustisen kitaran kanssa varmaan ei olekaan niin villi kuin Rock-keikoissa, näkisin kuitenkin mielellään myös akustisissa vahvistimissa sähköpuolelta tuttuja kulmasuojia. Nyt täytyy koko ajan varoa roudattaessa, ettei lyö vahvistimen kulmia vahingossa auki. Toinen parannusehdotukseni koskee kaiun säädintä, joka on AC-33:ssä yhteinen molemmille kanaville. Olisi kiva nähdä joko kummallekin kanavalle omaa kaikulähtöä tai kanaville yhteistä balanssi-säädintä, jolla voisi säätää esimerkiksi laulukanavalle enemmän kaikua kuin kitarakanavalle. Tällä hetkellä kaiun määrä on yhteinen, ja näin ollen kompromissi (jonka kanssa voi kuitenkin elää). Rolandin perussoundi on mielestäni erittäin terve, efektit kuulostavat nekin myös todella hyvältä, ja kaikki toimii niin kuin pitää. Loopperia varten suosittelisin lämpimästi sopivan tuplajalkakytkimen hankkimista, koska loopperin ohjaaminen käy sitten paljon sulavammin. Pienestä koostaan huolimatta AC-33RW on kunnon vahvistin, joka sopii mainiosti pienimuotoiseen esiintymiseen. Upouusi Roland Mobile AC on paristokäyttöinen, stereofoninen vahvistin akustiselle kitaralle sekä laulumikrofonille. A dedicated amplifier for acoustic guitar opens up plenty of interesting possibilities: most small pub gigs won’t require a PA-system anymore, because the majority of acoustic combos are equipped with a second input channel for a microphone. For larger gigs you can assign the acoustic combo to monitoring duties, putting yourself in full control over your stage sound, and then feeding your signal on to the FOH mixer. The Tanglewood T6 (current price in Finland: 396 €) is a very compact, two-channel combo, pumping out 60 Watts of power through an 8-inch speaker. 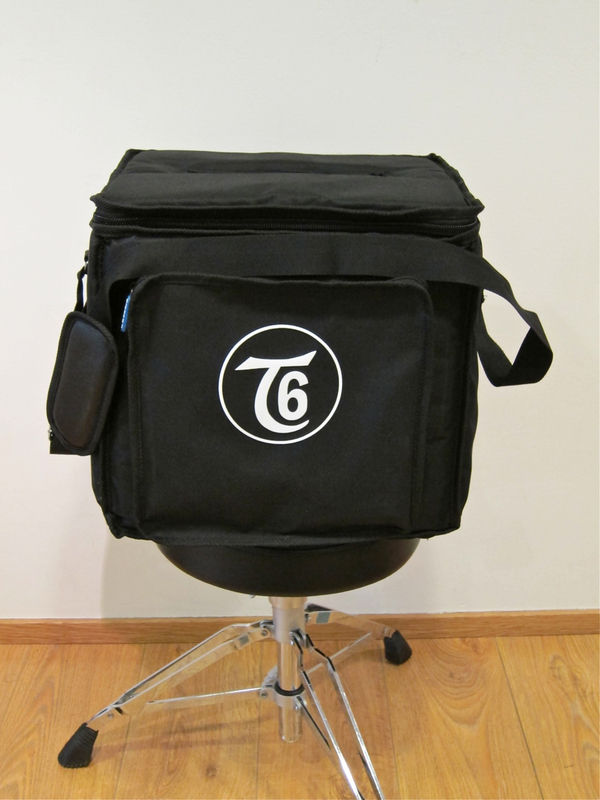 The T6 weighs a mere 11 kilos, and is very easy to transport thanks to the nice gigbag that comes with the amp. 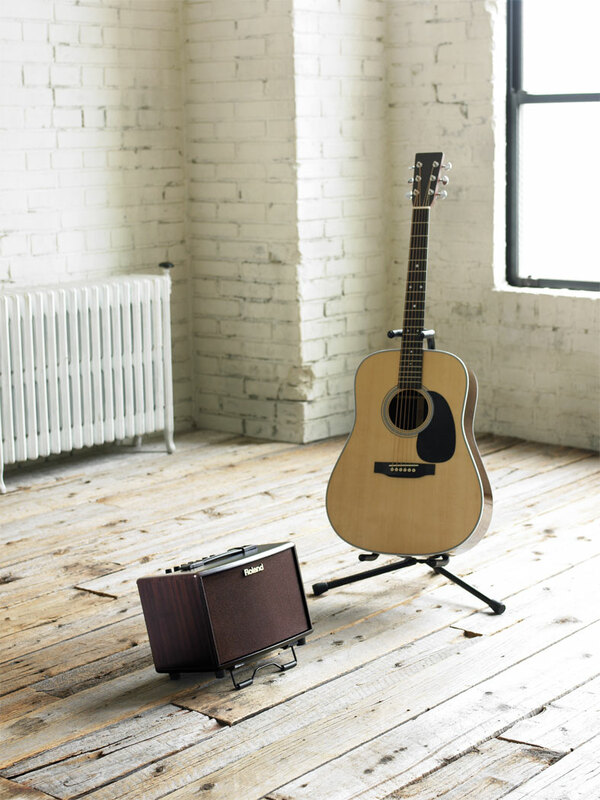 The Tanglewood feels rugged enough for regular gigging, with its cabinet covered in textured nylon. A fat foam grille protects the speaker. The T6’s first channel is meant for use with an acoustic guitar (or similar instrument), offering controls for gain and the 3-band EQ. The High/Low-selector lets you tame hot guitar preamps, while Contour adds brilliance to a dull signal. Channel number two is the right place to connect a microphone or a line level signal source. 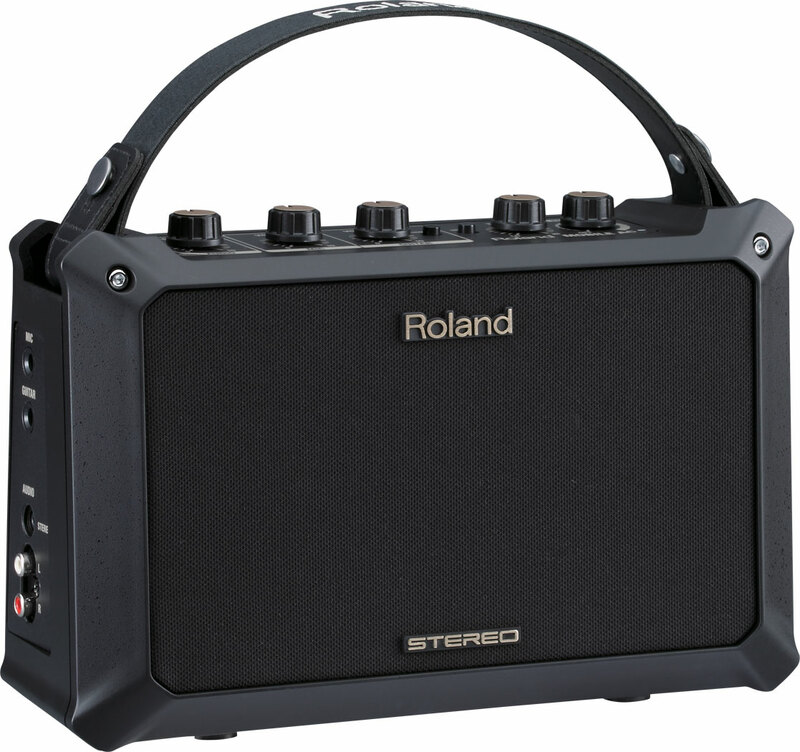 It sports an XLR/jack-combo connector, a Mic/Line-selector, as well as controls for gain and 2-band EQ. Tanglewood’s effects section lets you choose between four different effects – two different reverbs (Hall and Plate), one combination effect (Chorus/Room) and one delay. The Effect Pan -knob lets you assign the signals from both channels to the effect section’s input. Going all the way counterclockwise will feed only the signal off channel one to the effect, while going all the way clockwise only sends channel two’s signal to the effect processor. The Level control adjusts the amount of wet signal in the output mix. 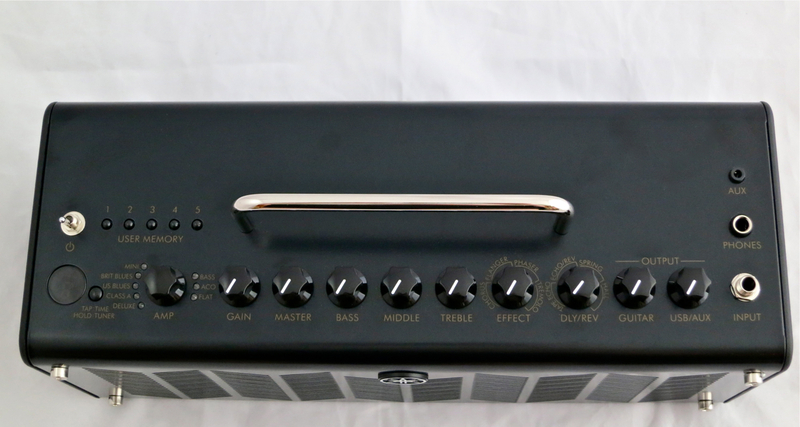 The back panel holds all the connectors necessary for the T6 to communicate with an auxiliary signal, an mp3-player, your tuner, a mixer or soundcard (XLR or line out), a pair of headphones, as well as a footswitch (for muting the effects on the fly). 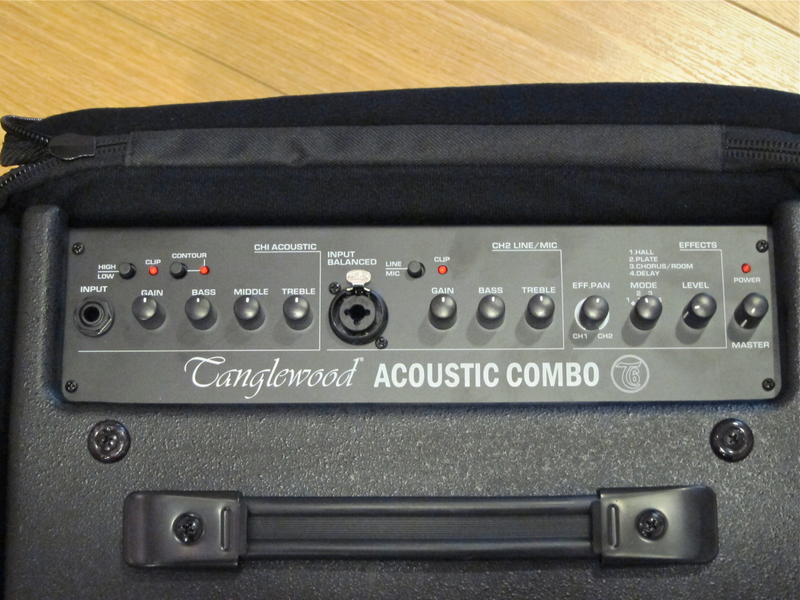 If need be you can even hoist the Tanglewood T6 up onto a speaker stand. The Delay-effect feels a little half-hearted; not because of its sound, but because the delay time is factory-set to a medium value, which will only fit some songs. A better solution would have been to have offered either a selector – slapback/medium – giving you two different time presets, or a full-blown tap tempo function, which would allow you to set song-specific delay times. If you’re on the lookout for an easy-to-use, good-sounding acoustic combo that won’t cost you an arm and a leg, I suggest you rush out to your Tanglewood dealer. With the T6 you only have to set your gain levels and the master volume, adjust the effect section to your liking, and you’re ready to roll. The amount of amplification is ample for most small pub gigs, and the T6 works well as a backline stage monitor, as long as you don’t play in a raucous Hard Rock band. The Tanglewood’s only real drawback is the complete absence of dedicated feedback-prevention tools, like a notch-filter or an automatic feedback defeater. Nevertheless, you can well work your way around this by positioning the T6 sensibly, and maybe closing you guitar’s soundhole, should you require high sound levels.